October is synonymous with festivities and this year was rather over-whelming. 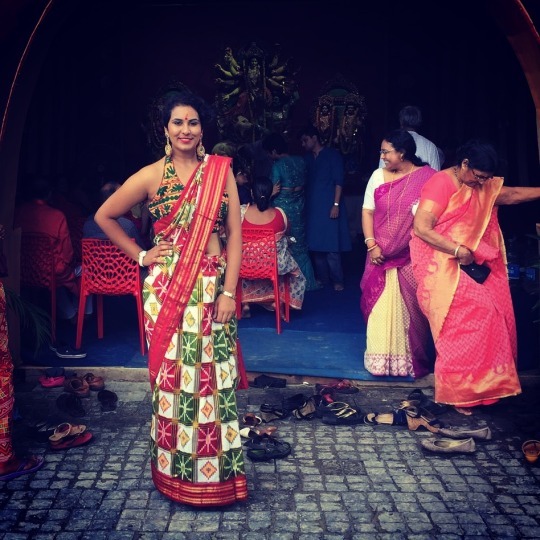 From Durga Puja to Diwali to so many blogger events in between. October gave me quite a few occasions to keep my OOTD game on point. Sharing some of my favourites and also their break up here. Autumn is all about layering! 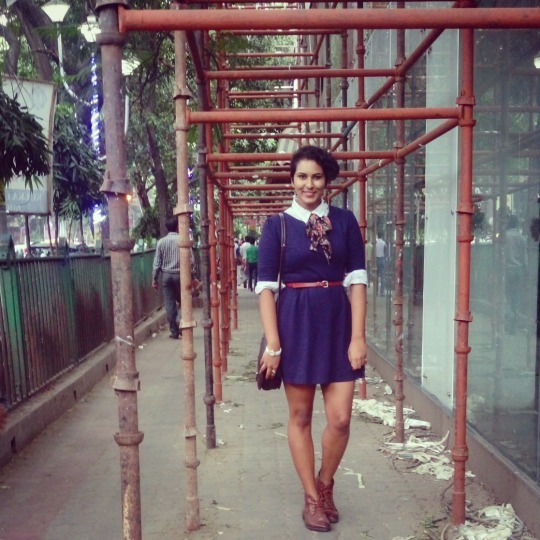 I layered a faint window-pane shirt with a blue skater dress to beat the slight nip in the air. A sash was used as a neck tie, tied in a bow. A tan belt to highlight the waist, brown combat boots, a marsala sling to keep it street smart, and a white ceramic watch completed the look for me. Occasion: A day out with my best girl; which obviously turned into an evening. Variation/Tip: To make things more interesting, instead of a shirt, you can opt for a longer shirt dress underneath and let it hang from under your dress for a more fashion-forward look. 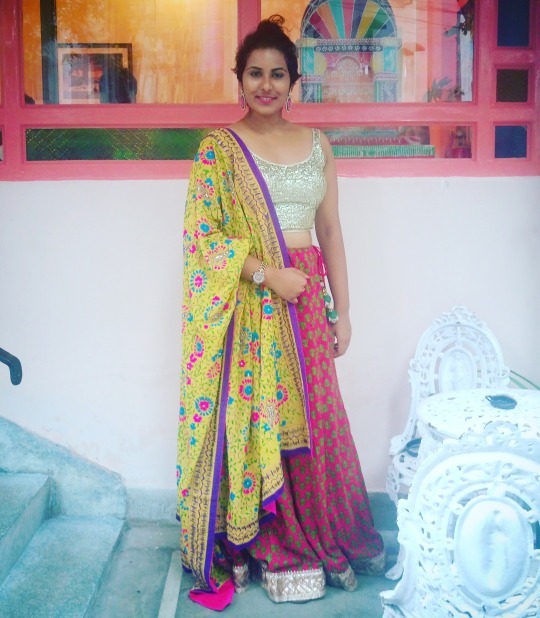 I don’t always wear a saree, but when I do, I ensure it is as traditional as Alok Nath. Also keeping in sync with the Navratri vibes, I opted for a Gujarati Saree teamed with an embroidered blouse from Gujarat itself. The halter neck added a bit of oomph to the look. Danglers, a classic white watch and a sleek golden handcuff finished the look. Variation/Tip: You can also opt for a fun, printed crop top if a head-to-toe traditional look doesn’t appeal to you much. If someone ever tells you bling and sequins should be best avoided in the daytime, I would reckon you better avoid those people! One doesn’t need that kind of negativity in their life. 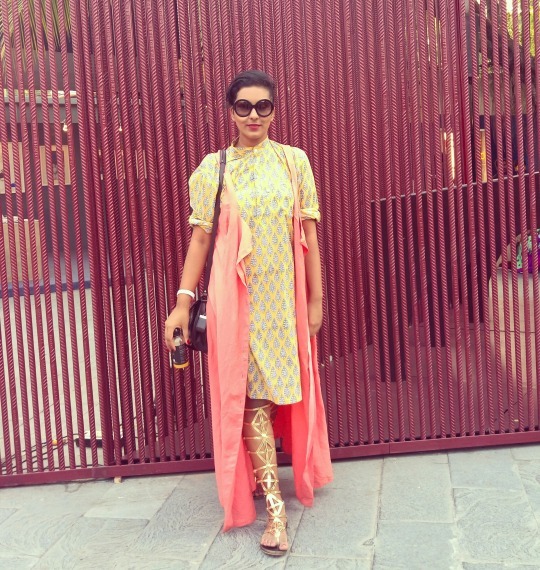 For a Dussehra Lunch, I opted for a sleeveless sequinned blouse and kept the rest of the look fairly toned down. A cotton printed skirt with some borders and a Phulkari dupatta seemed apt. A pair of lotus motif earrings and a rose gold watch were all i needed in terms of accessories. Variation/Tip: You can replace the Phulkari with a Kantha Dupatta or even replace the sequinned blouse with a collared shirt and a long necklace for a more regal look. Designer Ambrish Damani launched his new collection inspired from ‘Shidur’ this October and the bloggers were invited for a preview. Ambrish is known for fusing traditional in a contemporary fashion and hence I had to dress the part. 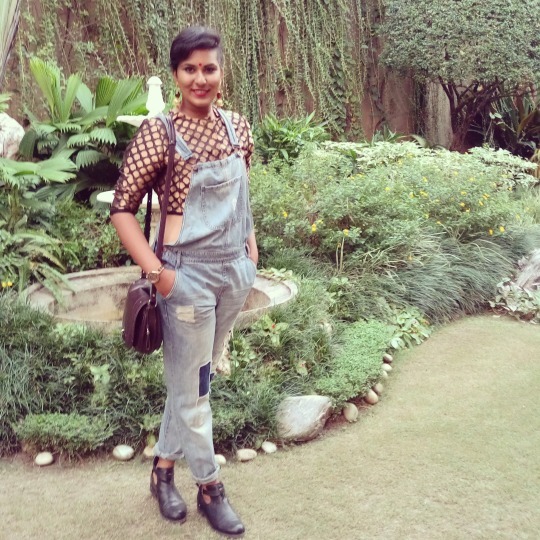 I teamed a cropped brocade jacket with a pair of distressed denim dungarees. Added all the Desiness with a red bindi and jhumkas. Black ankle boots lent all the edge to the look. My favourite marsala sling and a Rose Gold watch completed the look for me. Occasion: Designer Ambrish Damani’s latest collection “Shidur’s” preview co-hosted by Pen Twister. Variation/Tip: In case cropped jackets aren’t your thing, you can opt for a longer button-down jacket in a traditional fabric like brocade or silk, and team it with a tank and dungarees. The India Story was like a festival in itself bringing the best in fashion, food and art, under one common sky in Kolkata, with the common thread being that it had all to be #MadeInIndia. Again, I had to play the part, well almost. Teamed my dad’s printed Kurta with an orange over-sized button down jacket. A pair of statement golden gladiators and classic round frames completed the look for me. And oh, my loyal Marsala sling needs a mention too! Variation/Tip: You can replace the floor length jacket with a shorter version or even a denim vest will look uber cool. A pair of golden brogues will keep the look just as chic. The one thing I hate about flights is the fluctuation in the temperature. So hot to so cold; so unpredictable! Carrying a mildly warm jacket always comes handy. Teamed a pair of faux leather panelled tights with a window pane shirt(same as the first look) and threw on a Denim jacket. Ankle boots seem to be the ‘in’ thing this fall and got to admit, I fell a prey to it too. A pair of round frames to keep the blinding rays at bay. A sling to carry basic essentials. Another big handbag with mirror work and camel leather to carry my reading material, laptop and other not-so-essential things. Variation/Tip: To make things more fun you can add a pair of pin striped tights instead of basic blacks and a smart solo coloured satchel could replace something so bohemian for a more structured look. Diwali is all about putting your most festive outfit forward and that’s what i did. 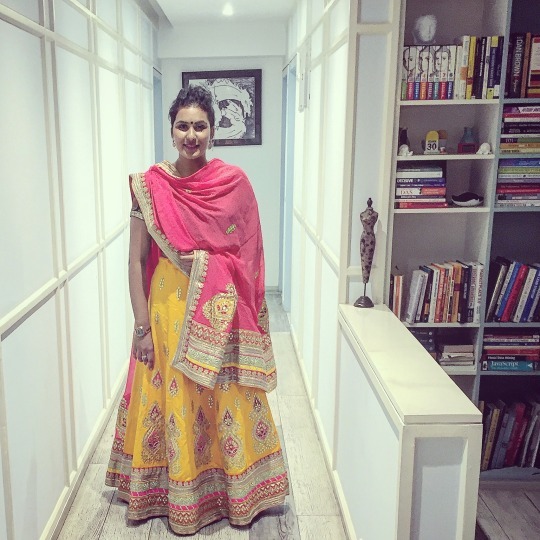 Teamed a Yellow Lehenga Skirt with a Coral Dupatta and a black embroidered brocade blouse. Opted for these really edgy silver earrings by Amrapali. The other end of these earrings were tucked into the little bit of hair that I have on my head currently. A black bindi and my typical rose gold watch stayed! Variation/Tip: A crop top with power shoulders in monochrome tones would look extremely edgy with a look like this. 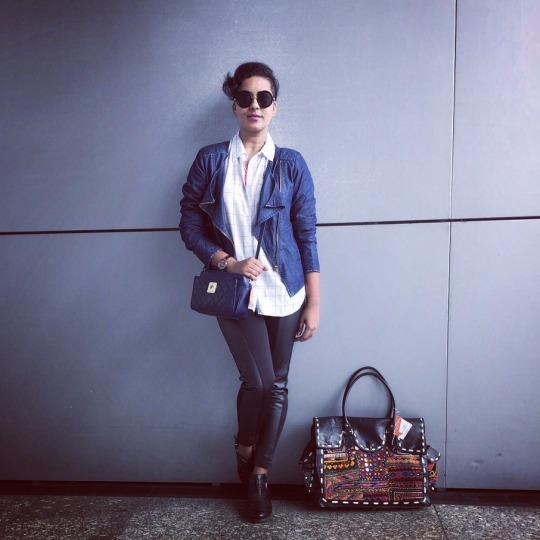 Do let me know which was your most favourite OOTD for the month of October. Next Post What to expect at Streets of India?